Jesse T: Greetings, mortals! As planeswalkers, we get to travel from one fantastic universe to another on a regular basis, but we recognize that many of you have jobs, and can only live vicariously through our experiences. Luckily, there’s Planechase Anthology. In this casual multiplayer format, you travel around to a bunch of different planes by rolling dice, which is a great temporary solution while you wait for your latent magical powers to manifest. We’ll take you on a quick tour of the multiverse, and show you some of the amazing places you’re missing out on in the meantime. Enjoy! T: Tolaria West, not to be confused with Tolaria, is one of Dominaria’s “Spice Isles”. For a long time, this caused many players to believe that large parts of Magic‘s fictional multiverse were actually located in central Indonesia. Like Tolaria, Tolaria West is also famous for its academy, sort of like Cambridge, England and Cambridge, Massachusetts. I assume it’s a military academy because they break down your entire hand before they build it back up again. 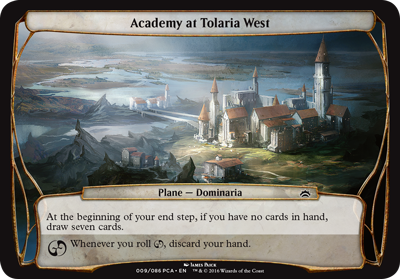 Jesse K: Tolaria is an interesting multiverse location, and one of the most frequently represented on cards (Tolarian Academy, Tolaria, Tolaria West, and of course Academy Ruins all depict basically the same place, at different points in time). I imagine that visiting here might be a little bit like going to Hogwarts, so I’m interested. It seems like it gets windy there, so hold on to your sorting hat. 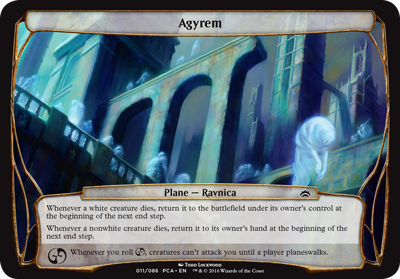 T: Agyrem, aka the Ghost Quarter, is where souls on Ravnica are trapped after they die. As you wander its maze-like streets, keep your eye out for power pellets, which grant temporary immunity to attacks from malevolent spirits. Agyrem operates according to the laws of the old Guildpact, which apparently means that white creatures come back to life slightly more easily than everyone else. K: Ghost towns have always been a confusing concept to me. I mean, as more and more people die, wouldn’t overcrowding quickly become a problem? I guess since they’re mostly non-corporeal, you could just really cram em’ in there, but even ghosts want dignity. I feel like Agyrem would be a nice place to visit, for the assurance that there is life after death, but you wouldn’t want to stay for long. Dice don’t fail me now! 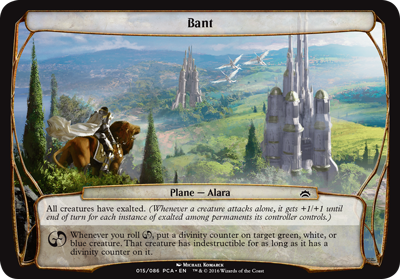 T: Bant, the most tourist-friendly of Alara’s shards, is home to the planeswalker Gideon Jura, and a bunch of lions with horse hooves. Bant’s social hierarchy is based on accumulating medals and awards, and no trip would be complete without your creatures getting a few special counters. As peaceful as it usually is, the nations of Bant still engage in highly ritualized forms of gladiatorial combat with each other. Speaking of which, how great would it be if instead of going to war, America just took soccer as seriously as everyone else did? K: That dice ability… Where have I seen divinity counters before? Oh… right. I guess now we know who took That Which Was Taken. You know what, this even explains Gideon’s invulnerability powers. Calling it now, it’s only a matter of time ‘til we see Kamigawa 2: The Bantening. T: Mercadia is home to some of Magic‘s least popular creatures, including goblins that aren’t funny, and Ramos the robot dragon. This time around we get to enjoy the multiverse’s largest outdoor shopping mall by making unfair trades with our friends against their will. If you’ve ever longed for the days when people couldn’t easily look up card prices online, this is the plane for you. K: The most fun thing about Planechase was getting a chance to revisit places that players categorically rejected. What, that doesn’t sound fun to you? Think of it like going to see a bad movie. I’m playing this Mercadian Masques Block constructed tournament ironically. T: Shandalar is one of Magic‘s oldest planes, so it may not run properly unless your computer is running in Windows ’95 compatibility mode, and you’ll definitely lose your progress if you get ensnared by any mysterious brambles. Consider yourself warned. The Wizards created Shandalar when they needed a generic fantasy setting, but Dominaria just wasn’t generic enough. 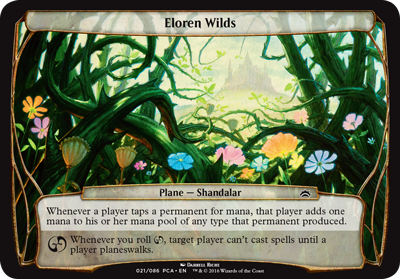 These wilds are unusually rich in both mana and deadly vines, so it’s a great place to go if you need a green sideboard card. 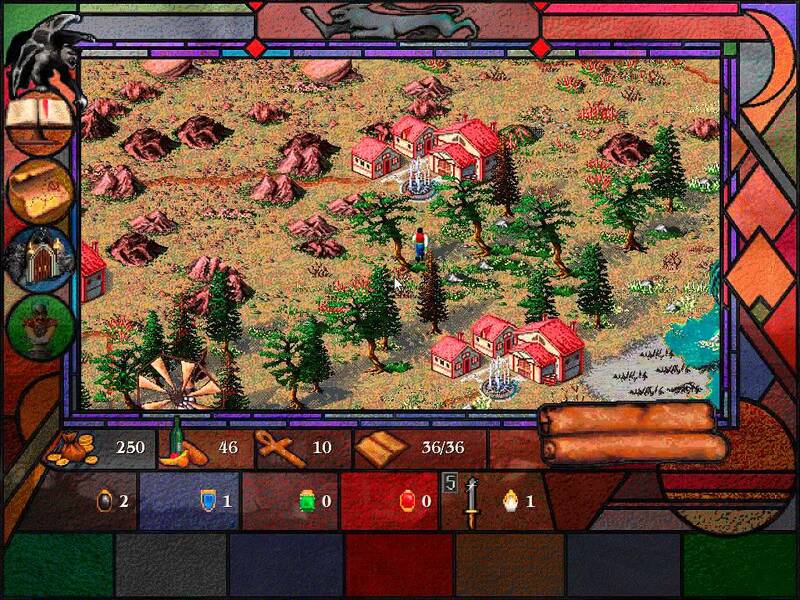 K: It looks like Shandalar has had a significant polishing for its reintroduction, and that’s a good thing because I remember it having hideous colors and being very low-res. Since the plane had no identity to begin with, I guess it’s just as well that they re-conceived it as that part in sleeping beauty where vines grow over the castle. T: Muraganda is a sweet prehistoric world populated by dinosaurs and cave people. 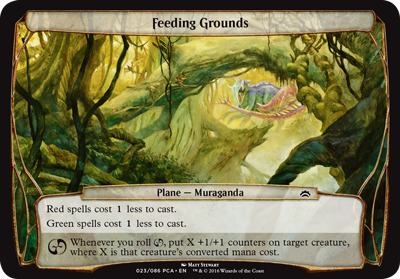 I’ve been incorrectly predicting that the next block is going to be set in Muraganda for years, so I must be missing some obvious way in which this idea is not totally awesome. Maybe they’re embarrassed about errata-ing dinosaurs to lizards. You can clearly make out this one’s bird-like features, such as a beak. I’ll still hold out hope we might see it at some point. Developing a set can be a long, Gruuling process. K: With concepts as unique as ‘place where animals eat’ and ‘the animals are really big’, anyone would be surprised that this rich vein of top-down design hasn’t been tapped yet. I’m only kidding. Of course I want to see Land of the Lost, the Magic Set. Just as long as they don’t drop the ball in the second set and introduce Will Ferrell as a legendary creature, I think it’ll turn out alright. T: Moag is Urza’s vacation home. He went there when he needed to relax and recuperate, and now you can too. I thought the name was a little weird at first, but it’s not like Earth is such a great name either. Remember to visit before the Phyrexians attack, because the resort stops serving continental breakfast, and the concierge may try to harvest your organs and turn you into an undead mechanical flesh demon. K: Remember the good old days when Wizards sometimes acknowledged that Magic novels existed? This plane (and several others in the list) are included only because they were in some random piece of word-count padding exposition. Remember the time Urza gained 2 life? It was exciting, but not as exciting as that other time when he gained 10 life. 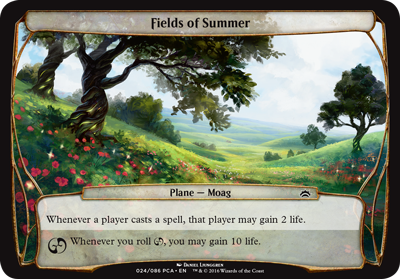 The rest is history, as they say, as Moag has become a fan favorite and an indispensable part of Magic lore. T: Settlers of Catan isn’t the only game with a randomized hexagonal board! 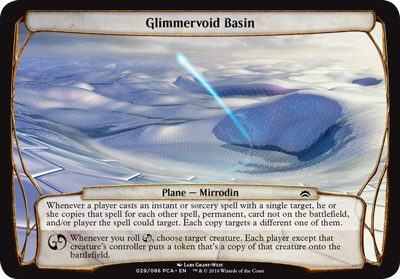 The Glimmervoid is made of mirrored metal, and it reflects magic spells, beams of energy, and even creatures. Try saying “Bloody Mary” three times while standing in the middle of the Glimmervoid Basin at night. I dare you. During the Phyrexian invasion of Mirrodin, a bunch of the tiles got damaged, which sounds like the exact opposite of compleation if you ask me. K: Ah yes, the Glimmervoid Basin, the most likely landscape in all the multiverse to be mistaken for an early 3D tech demo. While it might not be my cup of tea, this does feel like the sort of view our deadly robot overlords will one day favor. Maybe once Karn gets around to loading the textures, it’ll look better. K: Market research suggests that the only popular thing about Lorwyn was goats, so this kind of doubling down makes a lot of sense. I can only imagine that interplanar travel gets pretty stressful at times, since you’re just as likely to wind up on peaceful meadow world as you are to get thrown into a pool of molten lava and skeletons. Eventually all of these bad experiences make a planeswalker jumpy and trigger-happy. Are those just regular goats this time or is a Phyrexian or an Eldrazi going to pop out of them? Better to be safe and just burn it all to the ground. T: Not so loud! You’ll spook the springjacks! Sorry, I probably shouldn’t have shouted that. 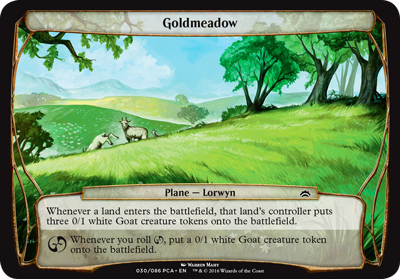 Goldmeadow is the home of Magic‘s hobbits, the kithkin, and while Llorwyn does eventually transform into Shadowmoor, it still isn’t anywhere near as dangerous as some of the multiverse’s other planes. Mistmeadow is actually a pretty nice place to live, unless you consider hearing the unabridged oral history of Jack Chierdagh, the great kithkin hero, to be some exotic form of torture. K: A spooky plane to visit in the dark, Grixis was a whole shard created by the whims of powerful inter-dimensional being, Nils Hamm. 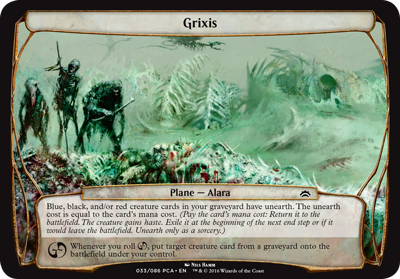 Since it’s basically an entire landscape made of corpses, no one exactly wants to live on Grixis, but the housing is affordable and the lack of social cache keeps hipsters at bay. If you imagine it as the Staten Island of Alara, you wouldn’t be far off. T: Ruled by sadistic demons and vampires, Grixis is a plane of scarcity and death, where the powerful dominate the weak by any means necessary. Personally, it’s not a plane I enjoy visiting, but as long as it’s consensual, I’m not one to judge. What I do have a problem with is the systematic exploitation of Grixis’ cheap, abundant labor by unscrupulous entrepreneurs. Even the undead deserve a living wage. K: There’s kind of an untapped idea here for a Norse battle plane that could someday lead to further development. 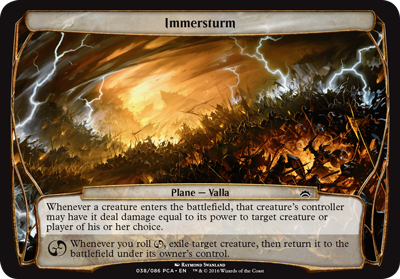 As for now, the card Warstorm Surge gets a whole plane all to itself. Maybe it’s for the best, since the concept of a plane where there’s a giant war and everyone’s always fighting is a little bit too close to what I imagine 2017 is going to be like to really be fun. Someone roll us back to the plane with the goats. T: Jeskai Pandemonium with Momentary Blink is my favorite casual deck of all time, so I have nothing but good things to say about this card. Why do creatures flicker in and out of existence? Who cares? Maybe it represents flashes of lightning. Don’t second-guess the will of the thunder god. Also, keep an eye out for Magic‘s own Avengers/Thor crossover special when the Gatewatch visits Valla. K: The land of the shapeshifters, Vesuva, raises a lot of important questions. What does a shapeshifter look like if there are only other shapeshifters around? How do you evoke cloning in a landscape? Who is that guy by the tree? The answers, respectively, are this, lots of clashing architectural styles, and Llanowar Augur. 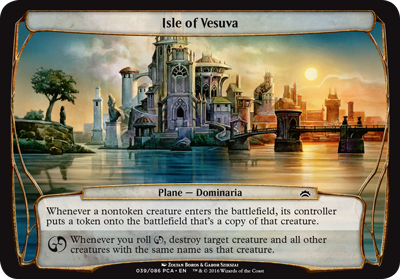 T: Vesuva, the Las Vegas of Dominaria, boasts all of your favorite landmarks collected in one convenient location. You can have lunch at Urza’s Tower, go snorkeling through a Shivan Reef, and grab a drink at the Adventurers’ Guildhouse all in the same day. It’s the perfect vacation spot. Unfortunately, Vesuva has no fixed location in space or time, so it’s almost impossible to find without GPS unless accompanied by several members of the cast of Lost. K: Ah yes, steampunk, a trend Wizards jumped into with both feet just after it peaked in popularity. You know, with their sense of timing, it’s amazing we didn’t get a Texas Hold’em themed set around this same time. With the way things are shaping up these days, we may be only a few years away from Breitban, the fascist nationalist plane. Hyped for troll tribal already. 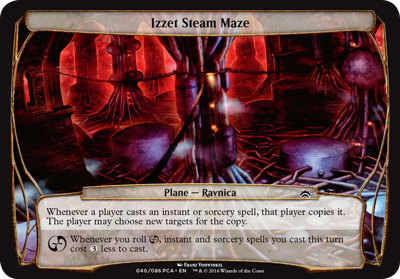 T: The Izzet Steam Maze finally brings all the excitement of water treatment and civic engineering to your kitchen table. It’s pretty functionally similar to the Glimmervoid Basin, so you not only have the ability to copy your spells, you also have the ability to copy the ability to copy your spells. Like me, Izzet mages are famous for their short attention spans, and will frequently like, I don’t know. Whatever. Next card! K: Krosan is best known for its unusually politically active beasts, and for being home to various famous grips, verges, and mights. In Krosa everything’s bigger, thanks to the presence of the Mirari, making it similar to Texas. Come to think of it, has anyone thought to check Texas for the presence of magical artifact radiation? I feel like it would explain a lot. T: Come on, Texas isn’t that bad. It’s not like it’s filled with giant lizards, horse-men, and pit-fighting warlords razing the land for its abundant natural energy. Okay, those are all bad examples. The average rainfall is definitely lower, though. Plus you’d only be able to make red, white, and blue mana when you roll the chaos symbol. K: Hey look, it’s Theros before it was Theros! I do wonder what was wrong with Arkhos as a name, but I guess they wanted to move away from the strong milling-matters theme hinted at in this card. Something I learned today was that this plane contains the River of Tears, so I guess we know where Morrissey would go if he could planeswalk. T: Arkhos is a plane of eternal twilight where memories can drift away like sand in a river’s current, much like Wizards probably hoped players’ would when they couldn’t legally use this name for their Greek mythology set. 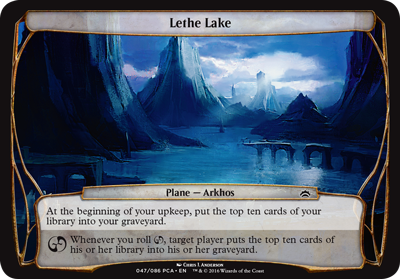 In the lower left-hand corner of the art, you can see a small group of spectral visitors on their annual trip to Lethe Lake, which they usually forget they’ve already made around this time every year. K: Llanowar is the unpronounceable land of elves, meaning that tree is probably filled with cookie-making machinery. While the abilities of the plane are flavorful, the problem is mechanical. 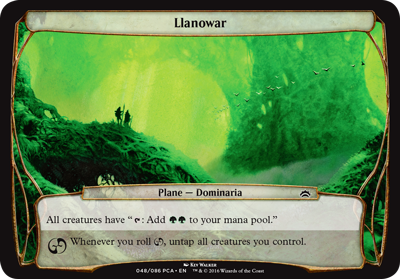 You are almost bound of leave Llanowar very quickly, since the die rolling in Planechase is paid for with mana, which the plane provides plentifully. It’s almost as if Planechase wasn’t designed with an eye for competitive play. T: Just to clarify, the Keebler Elves are not part of the Magic: The Gathering canon, although Brian Kibler has been known to play elves in many decks over the years. Llanowar Elves are famous for producing mana and wearing weird leather goggles, at least half of which is captured by this card. They are also known as “lawnmower elves”, which I assume is because of the way their druids tend the forest, much like a proud homeowner tends the lawn. Other distinguished mana-producing elves from Dominaria include the Fyndhorn Elves, the Quirion Elves, and basically all of them. K: There’s something appropriate about a supplemental product defiantly featuring so many unpopular locations, and then going on to fail itself. I can’t help but feel like Wizards has gotten more risk-averse these days, and would never take the chance of reminding players of something they didn’t like. A modern Planechase product would probably be all Theros and Innistrad and somehow Jace is a plane you can travel to. 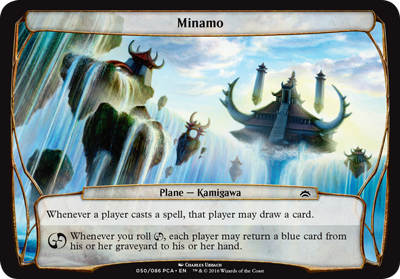 T: No collection of Planechase‘s greatest hits would be complete without a visit to Kamigawa, home of some of the worst keywords in Magic‘s history, including soulshift, epic, and the extremely-fun-but-poorly-named ninjutsu ability. Minamo is another wizard school, so I’d definitely expect to be able to draw some cards while there. After the Kami War, Minamo was destroyed by (I kid you not) the All-Consuming Oni of Chaos, who will hopefully appear as a legendary creature if Wizards ever decide to go back and do Kamigawa right. K: Boy, I sure was looking forward to returning to Zendikar back when this product came out. Well, time has passed, and it looks like BFZ will go down in history along with the Matrix sequels and the Star Wars prequels as the most disappointing attempted expansion of a series. 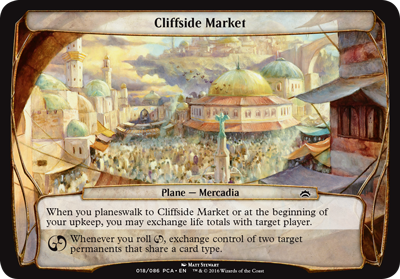 My idea for a more modern incarnation of this Planechase locale would definitely involve needlessly shifting cards between infrequently used zones, making everything colorless with no pay-off, and only being able to planeswalk away using wingdings mana. Also, the art is just a big ol’ pile of talc. T: I’ve got to say, it’s nice that we can travel through time as well as space, because a lot of these locations end up getting absolutely trashed. Murasa used to be a sprawling continent of mystery and adventure before it became a mound of Eldrazi droppings. This gives me hope that we might see other prequel sets in the future, like Shadows Prior to Innistrad, Mirrodin Beforehand, or Preturn to Ravnica. K: Is this that weird fire plane from Magic Origins that Chandra visits? No, huh? Regatha, you say? I guess that means there are two almost entirely disused fire worlds just sitting around. You might guess that this was proto-Kaladesh based on the onion domes and the existence of an efreet shah from the plane. I complained a little about our current set in the last article, but this means it could’ve been worse. I’m glad Wizards made the bold choice not to make their Middle-Eastern flavored set also a fiery hellscape. One step at a time guys! T: According to the Wizards’ official literature, “there isn’t even all that much interesting” about the plane of Wildfire. If you’re still not sold, maybe I can tempt you with a free Lava Spike sometimes. 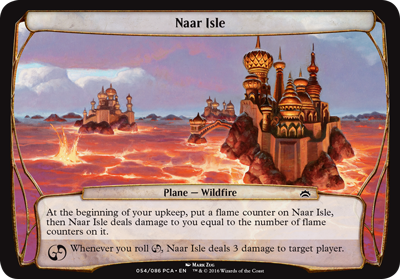 Every city on Naar Isle is a City of Brass, but apparently there’s only red magic to spend it on. The multiverse is infinite, so I guess it makes sense that there are a lot of duds out there. Maybe soon we’ll get to travel to Garagia, the Infinite Parking Lot, or Daveworld, a plane that’s exactly like our Earth, except everyone’s name is Dave. K: See how big those trees are? What about those awesome gargantuan beasts? 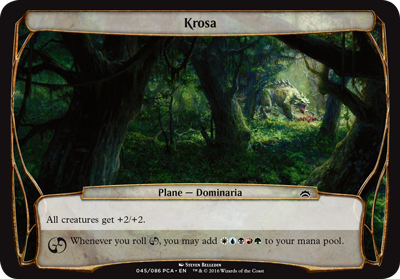 Am I talking about Krosa, Muraganda, Llanowar, Murasa, or somewhere else entirely? Naya is another Shard of Alara and is 7th or 8th plane we’ve visited today which has for its core concept the idea of abundant growth and overflowing mana. Look, we all love really big trees, but to paraphrase George Lucas, a tree without a story is a pretty boring thing. T: With Esper and Jund conspicuously absent, this is the last of Alara’s shards we’ll be visiting today. 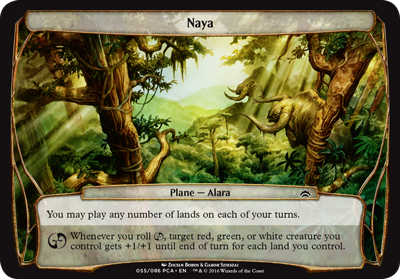 Naya has a rich and fascinating history of ancient nomadic civilizations and titanic beast-gods that is not at all apparent from the generic selection of abilities granted by this card. Fortunately, this isn’t the end. We still have 21 more planes to visit in volume 2 of the Planeswalker’s Guide to the Multiverse, Abridged. Be sure to come back in 2 weeks and see what other fantastic locations you can briefly set foot on before being whisked away by the capricious winds of chaos. Later, planechasers!